Whom Do I Treat Unjustly? “But whom do I treat unjustly,” you say, “by keeping what is my own?” Tell me, what is your own? What did you bring into this life? From where did you receive it? It is as if someone were to take the first seat in the theatre, then bar everyone else from attending, so that one person alone enjoys what is offered for the benefit of all in the common – that is what the rich do. They seize common goods before others have the opportunity, then claim them as their own by right of preemption. For it we all took only what was necessary to satisfy our own needs, giving the rest to those who lack, no one would be in need. Did you not come forth naked from the womb, and will you not return naked to the earth? Where then did you obtain your belongings? If you say that you acquired them by chance, then you deny God, since you neither recognize your Creator, nor are you grateful to the One who gave these things to you. But if you acknowledge that they were given to you by God, then tell me, for what purpose did you receive them? Is God unjust, when He distributes to us unequally the things that are necessary for life? Why then are you wealthy while another is poor? Why else, but so that you might receive the reward of benevolence and faithful stewardship, while the poor are honored for patient endurance in their struggle? But you, stuffing everything into the bottomless pockets of your greed, assume that you wrong no one; yet how many do you in fact dispossess? This passage from St. Basil’s On Social Justice has haunted me for several weeks now. His words sting with truth. Too often we live as individuals, disconnected from and indifferent to, or at least unaware of, the needs of others. Our fear that there will not be enough only creates the reality that there is not enough – usually for the other person though and not for us. We own nothing. Everything is a gift and a privilege – “grace upon grace” as St. John says – intended to be cared for and shared as a gift. Lent asks of us self-denial and fasting. It is not enough to simply give up something only to take it back at Easter. Maybe self-denial and fasting are not complete until whatever it is we have let go of has been given to and shared with another. 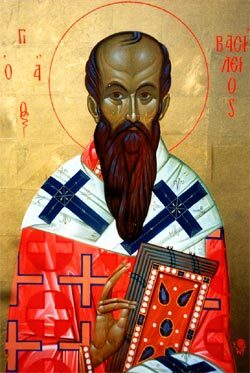 The most obvious level at which to understand St. Basil’s words is the physical level – physical bread, clothes, shoes, and money. But maybe these same things also have symbolic meanings – the bread of love, encouragement, and a good word that feeds life and nourishes growth; the clothes that offer dignity, protection, and identity; the shoes of freedom that enable another to live, move, and have their being; the silver that is another’s value and worth. How and from whom have we withheld bread, clothes, shoes, and silver, physical or otherwise? There are (or more accurately, I have) no satisfactory answers to St. Basil’s questions and charges, only excuses. Perhaps the only satisfactory response is confession and repentance. I am rich, greedy, and a robber. I must turn and face the other from whom I have withheld. I must give and share not only my stuff but my life. My salvation is somehow tied to their life, well-being, and salvation. So I wonder, what do St. Basil’s words bring up for you? How do you answer his questions? Mike,this passage haunts me too, along with a similar one from John Chrysostom. 23-24 “The land cannot be sold permanently because the land is mine and you are foreigners—you’re my tenants. You must provide for the right of redemption for any of the land that you own. 54-55 “If any slave is not redeemed in any of the ways I prescribe, he goes free in the year of Jubilee, he and his children, because the People of Israel are my servants, my servants whom I brought out of Egypt. I am GOD, your God. Do you know about the Catechesis of the Good Shepherd concept of the poverty of the catechist (surely derived from somewhere….)? It is somewhat similar to beginner’s mind. You have provoked a lot of thought for me! Jennifer, thank you for reading my blog and for your comment. Interesting passages from Leviticus – whether we see ourselves as owners or tenants influences, maybe determines, our relationship to God, others, and things. I am not familiar with the poverty of the catechist concept – makes me wonder about the idea that to know we do not know is the beginning of knowing. This is what I needed to hear, the passage is now haunting me too! Wonderful post, thank you very much. Mary, thank you for your comment. I am glad the post was what you needed – “hauntingly helpful,” I hope. Ayn Rand fans would have your guts for gaters — but you knew that, didn’t you? Steve, you right they would not be happy with me. Perhaps St. Basil will pray for me! 🙂 Peace be with you.